This was my first time to read a Lily Hawkins book, but it will not be my last. I received an ARC from the author via GoodReads and threw it my vacation bag on a spur of the moment. Glad I did because it was a great summer read. For Hawkins this time the "news" is literally on her front door step, when a beloved family member is shot, discovered by her boyfriend who is acting a little strange. The humor lightens up the book which deals with not only betrayal, but abuse, elder care and asks the question will you continue to love someone unconditionally after you learn the REAL truth about them. The story is flat out entertaining and if you are not laughing outloud during the on-air segment with the animals from the shelter - take your temperature because you can't be breathing.Although I prefer to read series in order, but I cannot wait to read another Lilly Hawkins book.Enjoy! Lily Hawkins is back in this third installment and is still a shooter (news photographer) for the Bakerstown television station. Christmas Eve, while sitting at work, she hears there’s been a shooting. Her ears perk up when she hears it’s at her home. Thinking that her boyfriend Rod was shot, she rushes home to find out that Ron is safe but her uncle Bud was the one who was shot.Within a two day time span, Lily is determined to find out why Bud was shot. She digs into his past to find a lot of strange things. Lily’s toughness and sarcastic nature makes her a colorful character and a heroine that made me enjoy sharing her exploits. This was an entertaining mystery and the reader gets to learn more about Lily. Lilly Hawkins, one of the most original heroines in all of mystery fiction, returns and comes to grips with the many challenges in her life laid out in the first two books in the series. After all her trials and tribulations in the series, she finally strives for and achieves the resolutions she has been blindly striving for, and all with wit, heart, and considerable adventure along the way. This book made me cry. This was a fun mystery with plenty of interesting characters. Add to that a surprise, heart-wrenching ending, and you've got an entertaining book to read again and again. It's a keeper. "Going to the Bad," 'is a humorous mystery that is so visual it's as if the hilarious scenes were taking place on TV and that maybe, Lucille Ball, had returned to a younger life and became the protagonist.The story begins with Lilly Hawkins at work. Her attention is diverted when a police scanner gives the address of a shooting. She realizes it's her own address and later, learns that her Uncle Bud had been shot.Zany things are happening at the TV station. The afternoon anchor is nervous about his first show where an animal shelter will bring some animals in cages with the hope that some might be adopted by viewers.Lilly seems to have two reasons for searching for the person who shot her uncle. From one point of view, it might be a good story but on the other hand, she's learned that her uncle was one of two suspects in a robbery and she doesn't want to bring dirt to her uncle's name.In a funny scene, Lilly goes to interview a woman who is elderly and has early dementia. The woman lives in a mobile home and the door is locked so she won't walk away when her daughter isn't home. She tells Lilly that she can come in via the bathroom window. When she does and begins interviewing the woman, the woman forgets who she is and begins screaming. Lilly has to beat a hasty retreat.There are some excellent characters in the story, led by Lilly. The action takes place in Bakersfield with a number of sub plots. The author brings the various parts of the story together in a satisfactory conclusion. Having met the wonderfully flawed protagonist, Lilly Hawkins, in McFarland’s book, Hot, Shot and Bothered, it was good to connect with her again. Lilly is a TV photographer for a Bakersfield, California news station. During the Christmas holidays, she is supervising the news stories, when one grabs her by the throat and won’t let go. She learns her beloved Uncle Bud has been shot. She also learns her uncle was embroiled in something shady and doesn’t want the police involved, so she can’t turn to law enforcement for help to catch his assailant. So, Lilly and her quirky co-workers, which includes one crazed, ugly little mutt called Thing, are on the case. McFarland writes distinctive dialog and descriptions. When she describes one character, Leonore, from Lilly’s P.O.V., she says: She was an optimist, a strange and exotic species I’d never understand. That type of writing tells us something about both Leonore and Lilly. Going to the Bad isn’t just a crime mystery, it also deals with family issues. Sometimes family can be a good thing and sometimes a person simply wants to escape their home life and familial responsibilities. Relatives often have their own mysteries they don’t want to share with others, even kinfolk. Lilly is forced to grapple with that as she strives to solve her uncle’s shooting. This reader loved watching her growth throughout the story. Besides creating interesting characters and complicated plotlines, McFarland made me laugh with her keen humor and cry with her insights into human nature. I highly recommend this book. Lilly Hawkins is a news photographer and she is good at her job. She takes grisly crime scene photographs and more often than not, finds herself caught up in the investigation. Christmas Eve, she hears on the scanner that shots were fired, so she moves quickly when she gets the location, her house! She knows that her boyfriend Rod is there and she's scared he's been hurt or worse.But when she arrives, she realizes that it's her Uncle Bud who was shot. She didn't even know he was in town. But neither here nor there, Lilly wants to know who shot him and why. With some help of her newspaper co-workers, she dives into the investigation, not liking where some of it takes her - into Uncle Bud's shady past. What ensues is a hysterical, page-turning suspense that will keep you thoroughly entertained. McFarland has a knack at character development and dialogue that really brings them to life. Lilly's sarcasm and wit gave me a few chuckles and I was impressed with the pace of this story.This is the first McFarland novel I have read, but it is the third in the series. Going To The Bad can be read as a standalone - I had no problems with back story of characters or events. However, I urge you to get the first two in the series, A Bad Day's Work and Hot, Shot, and Bothered, just because if they are anything as good as this one - they can't be missed. Mystery lovers won't want to miss this one! Going to the Bad is a tongue and cheek mystery, with a well-written plot and unforgettable characters.Lilly Hawkins is a feisty protagonist. She is not a reporter she is a news photographer who refers to herself as a shooter. She works for a small town television news station.Lilly has shot scenes of most of the violent crimes and tragic accidents in her town. A criminal scene is just another day’s job. But when the crime scene is her own home, it takes on a different dimension. Using her TV station’s resources and her own skills, Lilly decides to investigate the reason for this tragedy. She discovers a history of her favorite Uncle’s past misdeeds and betrayals and a strange long ago friendship with Leland Warner, an influential millionaire who appears to want to keep the crime quiet and the real truth buried. As Lilly delves deeper into the history of this small town, she places herself in jeopardy and could possibly become the next victim.Along the way Lilly is helped by her friends; some of the weird characters that probably exist in real life news stations. She encounters devious friends and foes; all are well developed by the author.I especially like the author’s ability to create emotional scenes that has the reader identifying with Lilly. Lilly Hawkins is at the news station when she hears about a shooting. The shooting is at Lilly’s place. Lilly fears the worst at first. Rod, Lilly’s boyfriend has returned home. Lilly thinks it is Rod but then discovers it is still bad as it is Lilly’s Uncle Bud. Lilly can not just stand by and wait for the police to figure out what happened to her Uncle Bud. Lilly takes matters into her own hands and discovers some family secrets that someone wants hidden. How high is the price…murder?Going to the Bad is the second Lilly Hawkins novel that I have read. This is a nice cozy, mystery series. Love Lilly. She is the back bone of this series and the superstar. She seems to always find herself in the middle of a story or murder. Although, she always finds her way out of the sticky situation. Lilly may want to think about switching from “shooter” to news reporter. I felt bad some for Rod. He was just trying to help and protect Lilly. He is a good guy. Although, the romance between them is lacking somewhat as Lilly is too busy getting out of jams. Not too many surprises in this story but still a fun and quick read. 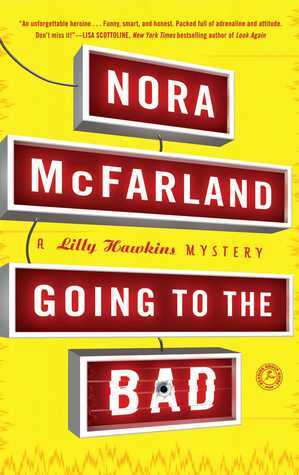 "Going To The Bad" is the third book in Nora McFarland's "Lily Hawkins Mystery" series, and to me, it is the liveliest, funniest book of trio. I adore Lily Hawkins as a main character - she is fiesty, smart and devoted to her job as a television news shooter, but also has the natural curiousity that leads her to search deeper and often gets her in deep trouble as a result! As this is reported to be the final book in this series, this book kind of wraps up Lily's story - and author Nora McFarland does give her fans a satisfying ending for many of the characters. But she does leave a tiny opening for perhaps a short sequel for Lily and Rod's life together afterwards. (I hope, I hope! )Fans of fast paced, fun and intriguing mysteries will enjoy Nora McFarland's "Lily Hawkins" books. I highly recommend them! I recieved this book in a GoodReads giveaway and I'm not typically into mystery books but this one was a rare exception.I have no prior history with this series and this is the third novel in it. I think it says a lot that although I had no prior background with the main character and her various companions, I had little trouble adjusting to the story. It certainly cannot stand alone as there were many mentions of previous events from what I assume are the other books, but they were brought up and explained in a manner that made sure I had no trouble adjusting to the story without the history.This story was also very well done in its ability to keep me guessing. Normally, I can easily figure out the ending within the first third of a mystery. Either I am getting lazy or the author is exceptional compared to other mystery writers I've read. Lilly Hawkins is manning the news desk as KJAY when she learns there's been a shooting at her house. She rushes there to find her uncle is the victim. While he fights for his life, she tries to figure out who shot him. What secret from his past has resurfaced? I love the characters, and I felt them grow even more here. And the story kept me turning pages to see what the next twist would be.Read my full review at Carstairs Considers. This is my first Lilly Hawkins mystery, and I had a bit of trouble getting engaged in the flow of the novel. But I have to say that by the time I finished, I was convinced that Lilly and her adventures are engaging, funny, and, well worth further reading. We have a nice accumulation of personal storyline, quirky and interesting characters, effective subplots, and a nicely moving plotline. I won "Going to the Bad" as a signed ARC from Goodreads' First Reads giveaway. This this the first book I've read by Nora McFarland and I look forward to reading more by this author. There's plenty of humor in this mystery and the plot was well thought out. I had no idea "who done it" until the very end. Some "lite" blood and gore take this out of the cozy category (for me, anyway) and I found it a fun, easy read. An enjoyable mystery. I found it funny that the main character, Lilly, points out when she is doing stupid things. Instead of being a PI, Lilly works for a television station. I can't say that any of the characters really came to life for me. I might try another in the series and see what I think. The story is enjoyable due to McFarland’s taut writing and well-developed story line. In spite of the life and death situation, much of the story is light-hearted because of Lilly’s quirky friends and co-workers. Going to the Bad will please readers who are looking for a light-hearted mystery, a cast of unconventional characters, and a down-right fun read. The author tries to portray the main character, Lilly Hawkins as quirky and cute but she just comes across as annoying and clueless. Other than her (which let's face it is the biggest part) it's not a bad story. This is the first Lilly Hawkins book I've read, and I enjoyed it very much. Some of Hawkins' adventures in "reporting" required some willful suspension of disbelief, but that made for no less exciting reading. Will probably seek out more books in this series. Good reads win: This wasn't one of my favorite reads but it was still pretty good. I guess is could have been because I hadn't read the other books that involve Lily Hawkins. This novel it totally worth the read for mystery readers. Characters were likable, plot line was interesting, but overall I felt like some type of spark was missing for me. It was a good book, but something just seemed to be holding it back from reaching its full potential (although I am not sure what that something is). The characters are well defined. The entire book takes place over a 24 hour period (with many flashbacks). I enjoyed it, and want to read more of Nora's books. Nora McFarland - Nora McFarland has worked for CNN and has an MFA from the University of Southern California's school of cinematic arts. She lives in Macon, Georgia.